Monogram displayed at my friend, Vicki’s wedding. 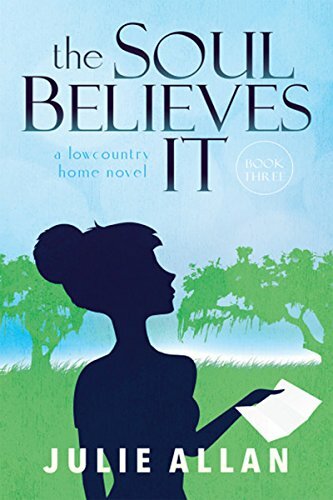 In The Soul Believes It, the third book in my lowcountry home series, I had the joyful task of planning a wedding for one of my characters. The book will be out this Summer and I hope you enjoy wedding storyline as much as I enjoyed writing it. Fortunately, I have been a guest at several beautiful weddings in the past few months and one of them was at Alhambra Hall, the setting for my fictional reception. The picture above was from that wedding. I loved how they placed the new monogram for the bride and groom as a couple on the mantle. I was even inspired to have my character’s new last name, to begin with, an M. I love how M’s scroll and I liked the idea that my character’s maiden last name was W, so it was a flip, a visual representation of what women do when they take their husband’s name. Now don’t get the wrong idea, I’m a traditionalist. I’m not fond of the hyphenated name or the wife keeping her maiden name, especially if children follow, it just gets confusing to me. I’m also of the school of thought that to each his, or in this case her own, I have no problem with other women choosing any option. I used to wish I could marry someone with a last name that began with G, simply because I liked the idea my initials could be JAG, perfect reason to get the car, right? When I monogram things with just one letter, I waffle between J, because that is forever, or A because that is for family. It is one of the only times I’m jealous of men, they never have to change their initials, their identity is set at birth. On the bright side, new brides can embrace a new monogram. There is silver, glassware, towels, purses, linens, sandals, you name it, it probably can be monogrammed. What a delightful way to embrace your new identity.